St. Mary’s Church, a stunning and historic structure, was built in 1892 to serve the original Catholic “mother” parish of Wausau. This noble edifice replaced an earlier log cabin church dating to the founding of the parish several decades earlier. St. Mary’s was formerly a German-speaking parish where the Sunday sermons were delivered in German, and remained so into the 1930s. 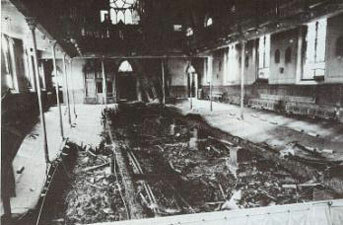 The church is one of the most exquisite examples of neo-Gothic architecture in Wisconsin, but in 1953, a devastating fire completely destroyed the interior of St. Mary’s. In the following years it was restored in a more modern style, combining the taste popular at that time with some elements taken from the original neo-Gothic design. Despite the destruction wrought by the fire, St. Mary’s continued to be the most stately and prominent of the old ecclesiastical edifices in Wausau. 2017 marked the 125th anniversary of the church building. In 1999, the Most Reverend Raymond L. Burke, then-bishop of La Crosse, announced excellent news for the future of St. Mary’s: the church, which was otherwise unoccupied due to the merging of several Wausau parishes, would be entrusted to the Institute of Christ the King as a center for the traditional Latin Mass. 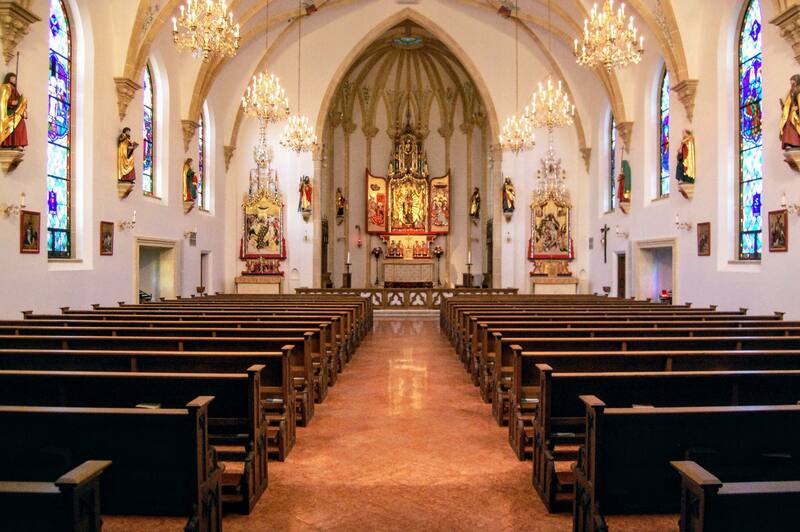 The Scholz Family Foundation obtained a long-term lease from the diocese for St. Mary’s and immediately began a complete restoration of the entire church. Through a singularly generous donation, the Scholz Family Foundation was able to bring St. Mary’s back to an even greater splendor than its original beauty. 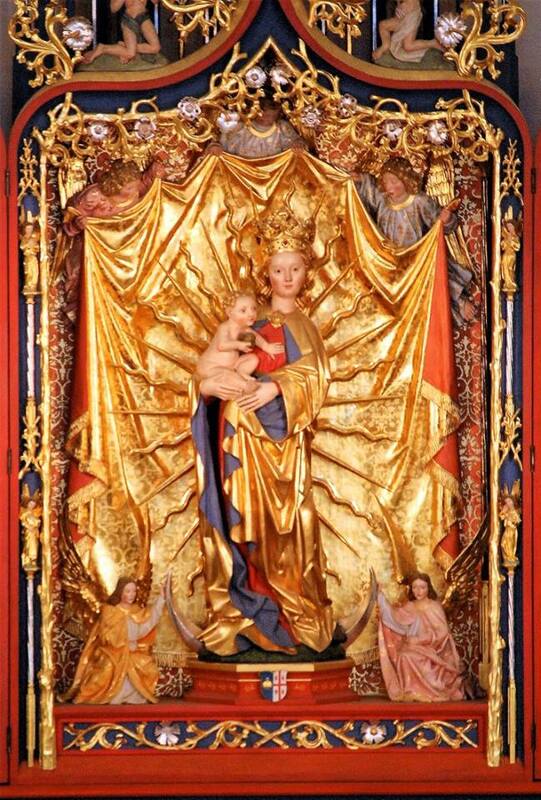 Walking through the doors of St. Mary’s now reveals the magnificence of authentic High Gothic architecture; the three altarpieces reproduce original works of art from the fifteenth-century Blutenburg Chapel in Bavaria, and the high altar features a statue of the Madonna and Child dating to the 1480s, just before the discovery of the Americas. The tasteful stained-glass windows, depicting the life of the Virgin Mary, were retained from the renovation of the 1950s. Painted rib vaults and new, traditionally carved statues of the Apostles complete the interior decoration. American and European artists, craftsmen and architects collaborated to bring this unique project to a successful conclusion. On May 31, 2003, Bishop Burke consecrated St. Mary’s in a solemn ceremony, one of the most impressive rites in the Catholic liturgy. To this day, St. Mary’s continues to receive the blessing, love and fatherly support of now Cardinal Burke. Shortly after the consecration of the restored church, Bishop Burke elevated St. Mary’s to the status of a public Oratory – which functions like a parish, featuring the full range of sacramental life, but without geographical boundaries – entrusting its care to the Institute of Christ the King Sovereign Priest. St. Mary’s Oratory of the Immaculate Conception, as the church is now called, continues to celebrate the sacred liturgy in the traditional Latin rite for the diocese of La Crosse, in implementation of Pope Benedict XVI’s motu proprio Summorum pontificum. St. Mary’s is currently a thriving apostolate within the larger family of the Institute of Christ the King, with the number of faithful continually growing. The canons of the Institute resident at St. Mary’s assure the daily celebration of Holy Mass and the Divine Office, as well as providing daily confession and regular faith formation classes for children and adults. Recognizing the priority of the sacred liturgy, the Oratory has an excellent choir and a large team of well-trained altar boys; the work of passing on the faith to the next generation is advanced through our young adults group, as well as youth groups for boys and girls. The future of the Oratory has been placed under the protection of the Blessed Virgin Mary and with her help, in the years to come, St. Mary’s Oratory will certainly attract many more souls through the timeless beauty of the traditional liturgy – not only those souls who have always loved this ancient rite but indeed those souls who have never before experienced the majesty of this precious treasure of our Catholic heritage. Our Lady of the Immaculate Conception, pray for us!